Ivan Leonard, of Apache Junction, Arizona passed away on July 4, 2010 at age 90. He was born on June 9, 1920 in Goodsprings, Alabama. Interment will be at the Phoenix Arizona National Cemetery on July 9, 2010 at 2 p.m.
daughter, Kathryn Leonard of Arizona, his 10 grandchildren, numerous great grandchildren, and great- great grandchildren, a number of cousins, nieces, nephews, great-nieces and nephews, and great-great nieces and nephews. Hocutt Leonard, his Daughter Mary Rudd, and his four brothers, and one sister. Honorary pallbearers are Don Martin, Dewey Ervin, Terry Douglas, and IBEW local 441. 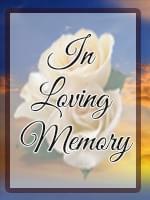 Dear Family, I am so very sorry about the loss of your dear loved one. May the thought at Job 33:25 give you comfort in knowing that Mr. Leonard will return to the days of his youth and be able to enjoy life without the infirmities of old age. My sincere condolences to you.